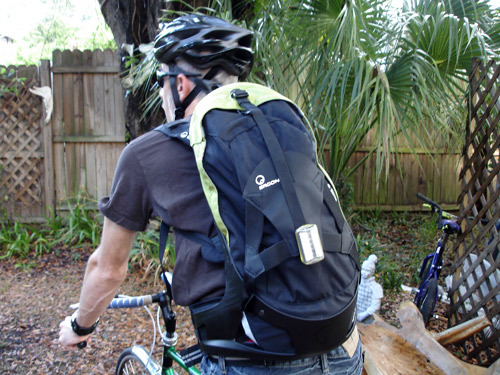 Our friends at Ergon Bike Ergonomics recently sent us a backpack to check out. This model is called the BD-1M “Team Edition” backpack, and it is sleek and packed with features. Originally, RL was slated to test this backpack…but with his husky, macho physique, the harness system was a bit too snug. We needed someone willowy and narrow to test this bag, so the duty fell to me. As it turns out, the system is just a hair too BIG for me, but I got the bag’s straps and buckles adjusted to the point that everything worked out in the end. Phew! Let’s get something straight right here at the beginning — Ergon does NOT market this bag as a commuter-specific backpack. In fact, it’s intended for the MTB crowd…a bag that can carry a hydration bladder, some tools, snacks and a jacket. At only 12 liters (730 cubic inches or so), it is not designed to carry a huge load. That being said, it does what it is intended to do splendidly! 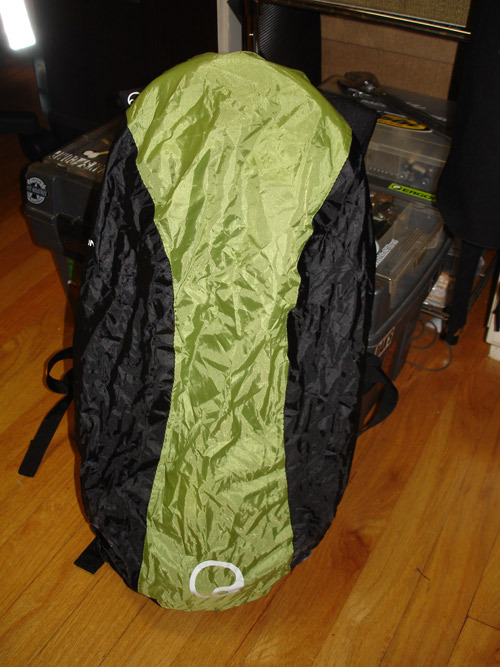 Anyhow, on to the bag itself: It’s made of black and pea-green woven nylon, with a very visible hard plastic “exoskeleton” that gives it shape and forms the suspension components of the bag. 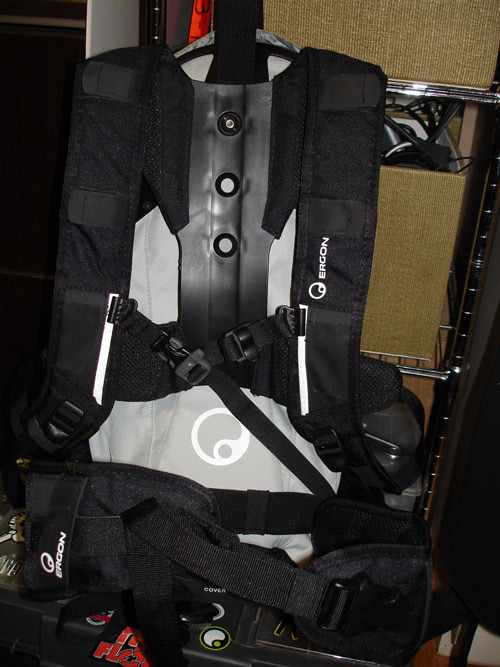 All of the harness parts (shoulder straps, back pad, hip belt and sternum straps) are attached to the exoskeleton. The back panel adjusts using a simple hex screw and nut to fit a range of backs…I have it set to the “small” setting. 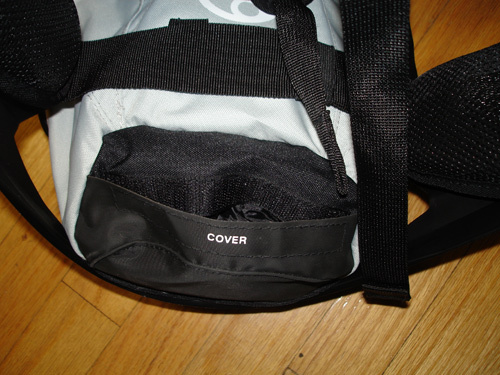 Not visible is Ergon’s flexible link or “Flink” — a plastic sphere right behind the adjusting screw of the back panel that separates the bag itself from the harness system. 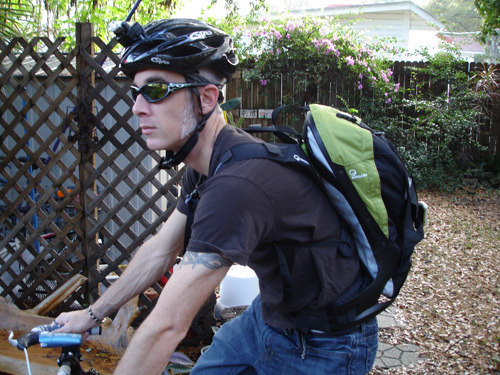 This “Flink” allows the bag to pivot both up and down and side-to-side with the rider, staying balanced between the shoulder blades no matter what the load. The bag hugs the rider’s back, yet lets a surprising amount of air to flow between bag and rider. The padded portions of the hip belt and shoulder straps are lined with mesh to let additional airflow in. 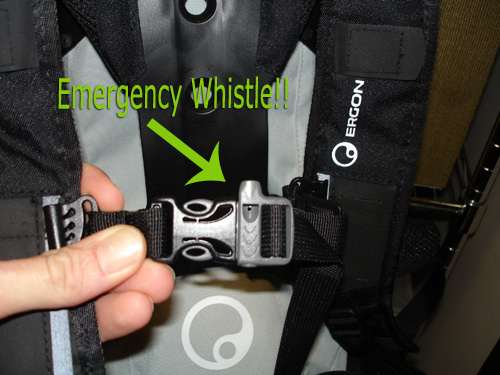 Ergon even included a built-in emergency whistle, which is molded into the buckle of the sternum strap. Amazing! Well, how does this thing ride? I took it on one commuting trip to work — loaded down with two 500ml bottles of soda, a bulky hardcover book (Crusade: The Untold Story of the Persian Gulf War by 3-time Pulitzer Prize winner Rick Atkinson), a work shirt and assorted tools, tubes and small items. It was a tight squeeze…and God forbid if you had to get something at the very bottom of the bag. The narrowness of the interior compartment and the overall small volume means that you must unpack everything to get at goodies in the bottom of the bag. Even with this load (maybe 15 lbs.? ), the bag felt weightless once I got the straps snugged up. The padded hipbelt soaks up the most of the weight, and the shoulder and sternum straps serve to stabilize things. I felt FAST wearing this bag, and I never once worried about the bag shifting while I cornered or got out of the saddle to do some sprinting. Pretty cool so far! In the coming weeks, I will test the waterproofness of the raincover, check the durability of this bag and offer further thoughts about the performance and balance of this system. Stay tuned for all of that. That back pack has to be the coolest back pack I’ve ever tried. I was lucky enough to try it out at Interbike, and the demo they had weighed at least 30lbs….like you said, its weightless. I didn’t even see that emergency whistle! Now that’s cool! Interesting bag, gotta wonder if its worth the $130? I have have been using the LA Rescue USAR Mate – http://www.buyemp.com/category/Medical-Equipment-Bags-Cases.html , a clip-on blinkie fits the the loop tabs (black) perfectly and the reflectors are Very Visible, I wear it as a shoulder bag mostly, though no sterum strap. Anyone know of a similar bag with a sternum strap? With a bag like that USAR (it’s really a fannypack), you’re back to the thing shifting and flopping all over the place. Even a messenger bag with a cross-strap to stabilize it shifts around a bit on your back (I periodically have to reach back to adjust my Timbuk2, and that can be annoying)…but this Ergon backpack WILL NOT shift. Once the straps are on, this thing is rock-solid.